This Almond Nutella Cake has the coffee goodness of a tiramisu cream with the nutty sweetness of macaroons and is laced with Nutella. It's best served the next day. p.s. it's gluten free. 3/4 cup granulated sugar divided into 1/2 cup and 1/4 cup. Trace three 8-inch circles on parchment paper (I baked all 3 layers at once - two on one large baking sheet and one on a second sheet). Trace in a bold pen or permanent marker then flip the paper over so you can see the tracing without putting the batter directly over markings. Lightly butter top of parchment paper with a paper towel. Arrange baking racks with the first rack in the top third of the oven and the second in the bottom third. How to Make the Almond Cake Layers: Preheat Oven to 325˚F. In a large bowl, combine: 325 grams almond flour with 1/2 cup sugar, and 1/4 tsp salt, and thoroughly whisk together until no large clumps of flour remain. In the clean/dry bowl of your KitchenAid stand mixer fitted with the whisk attachment, beat 6 egg whites on high speed for 1 minute or until soft peaks form. With the mixer on, add in 1/2 Tbsp vanilla then add 1/4 cup sugar and continue beating on high speed for 2-3 min or until stiff but manageable. Fold the egg whites into the almond meal gently, about 1/2 cup at a time until no streaks remain. Divide and spread batter as evenly as possible (they'll stack better later!) onto the three traced circles of your parchment paper. Bake at 325˚F for 12 min, rotate pans between racks and bake another 12 min. Turn oven off and keep in the oven another 15 min. You want it to be dry and crunchy on the outside and semi-soft inside. Remove from oven and let cool to room temp on a wire rack. In the bowl of your mixer, combine 3 cups heavy whipping cream with 1/4 cup sugar and beat on high speed (1 min) until soft peaks form, add 2 tsp coffee extract and 2 tsp vanilla extract and continue mixing on high (1-2 min) until spreadable (don't overbeat). Cover and refrigerate until ready to use. 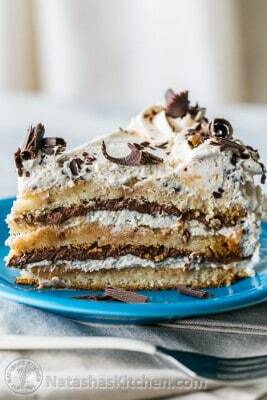 Spread Nutella on the bottom of two of your cake layers and set aside. Add Nutella based on how sweet you like your cakes - I used 1/2 a tub for my fierce sweet tooth but you can use less 1/3 if you prefer less sweetness. Place the third cake layer (without Nutella on it) on a cake stand and cover generously with frosting. Top with the next layer, Nutella-side-down. Cover the top with frosting. Repeat with last layer then frost the top and sides of the cake. I piped a border around the top of the cake with my large Wilton open-star frosting tip. Top with chocolate shavings, chocolate curls, or grated chocolate covered espresso beans. Refrigerate cake 6-8 hours, or overnight since the almond layers need time to soften up; otherwise it will be difficult to slice. *On measuring/weighing flour: I weighed 325 grams almond flour, but if you don't have a kitchen scale, you can measure out 3 1/2 cups almond flour using this method: spoon flour into the measuring cup and scrape off the top without packing flour down. Tip: I made the chocolate curls by melting chocolate then spreading it thinly over the back of a baking sheet. Once it cooled, I scraped the pan with a food scraper to make the curls. You could also use a butter knife. Tip: For ease of slicing, remove the cake from the refrigerator about 30 min before serving.